I was lucky. I knew what I wanted to do, and there are many who come to university not knowing what they want to do. Many children dream about studying dinosaurs when they grow up. Dalhousie graduate Victoria Arbour has followed that dream and continues to study the fossils of ankylosaurid dinosaurs. 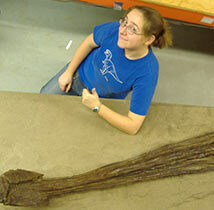 In December 2009, Arbour and her colleagues also had an opportunity to study a 76-million-year-old dinosaur at the Royal Ontario Museum in Toronto, and solved an 85-year dispute over what species the skeleton should be classified as. And in January 2011, Arbour identified a new species of prehistoric flying reptile from a fossil found on BC's Hornsby Island, the pterosaur Gwawinapterus beardi. “Paleontology is something I’ve wanted to do since I was small,” Arbour said. While at Dalhousie completing her B.Sc. in Biology and Earth Sciences, Arbour spent summers identifying calcareous nannofossils from the Scotian Slope, a geologic area off the shore of Nova Scotia, and described a fragmentary dinosaur specimen from the Sustut Basin of British Columbia for her honours thesis, supervised by Milton Graves. She felt very fortunate that she was given the opportunity to do hands-on work for her thesis, and is grateful for the opportunities the Earth Sciences department afforded her. Arbour completed her M.Sc., “Evolution, biomechanics, and function of the tail club of ankylosaurid dinosaurs (Ornithischia: Thyreophora)” in 2008 and is now working on her PhD at the University of Alberta. The focus of her research continues on ankylosaurid dinosaurs, their evolutionary trends and family relationships within the group, and similarity between those found in Asia compared to those found in North America.